Need help developing copy for a specific project, support for your ongoing content efforts or copyediting content you’ve drafted yourself? Do you just want to talk to someone and have them transform your word jumble into copy you're proud to put out into the world? You’re struggling to create copy that works for your business and are totally intimidated by a blank page, especially because you don’t consider writing one of your strengths. Between running your business and getting that much-needed family time, you simply don’t have the time to create the content you envision. The specifics vary by project type. If you have a project in mind or want to discuss what’s possible, schedule a virtual coffee date and we can discuss the details. Every business needs a story. It’s how you explain who you are and what you do with clarity and consistency. It’s how you make yourself stand out, and how you create a connection with your audience. If you aren’t clear on what your story is, no one will be. You aren’t sure how to talk about your business and you need help crafting a solid message. You need help making your existing story sound polished and true-to-you. We’ll start with the basics—I’ll send you a short questionnaire to gather some information. Then I’ll dig deeper during a strategy session (via phone or Skype) to discuss your vision and uncover those special things that make your business unique. I'll combine the big picture with the small details to create a business story that feels right to you AND helps your business thrive. A longer version of your story, that explains who you are + what you do in a more comprehensive way. 2-3 short descriptions that position your products or services in a clear, concise way that appeals to your audience. We’ll tackle your biggest content challenge and discuss some realistic, doable tactics you can use to accomplish what you’re dreaming of. First, let's get on the phone to chat about your business, your needs and how I can help. Once you’ve booked your session, I’ll send you a questionnaire to get some details about you, your business + your goals. Then we’ll schedule a 60-minute brainstorming session (via phone or Skype) where we’ll dig into it all together. We’ll talk strategies, tactics and how we can make it all doable for you. After the call, I’ll send you a recap sheet that summarizes what we talked about and provides information on any additional tools + resources you will need to accomplish everything we discussed. You have a website but it just doesn’t sound like you. You know your site needs to be a stellar reflection of your brand, attract your ideal audience and help you grow your business, but right now its just…not. And you’re not sure why. Or maybe you know why, but you’re just not sure what to do about it. You know you are fabulous, but you also know your website doesn’t make you sound that way. The website review will give you a customized action plan for making specific changes that will make a big impact on your business. After you book a website review, I’ll send you a short questionnaire so I can find out more about you, your business and your goals. Then we’ll hop on the phone (or Skype) for 30 minutes to discuss your answers and allow me to dig a little deeper. Our talk, your questionnaire answers and insights provided from your Google Analytics will give me the fuel I need to create a website strategy document that's completely personalized for you. A detailed action plan for making meaningful changes to your website. The plan will be broken down into easy-to-follow steps and include a list of resources you can use to help achieve your goals. Once we have a plan in place, I can provide content creation support or you can execute the plan on your own. First, let's get to know each other. Have a blog? Love that! It’s one of the best things you can do for your business online. But if it’s not making an impact, that’s more than a total bummer. It’s a waste of your time, money and fantastic talents. I’ll help you figure out why you aren’t attracting your ideal audience, outline the content changes you can make to stand out + get noticed, and help you set realistic goals for the future. You have a blog, but it’s not making an impact on your audience or your business. 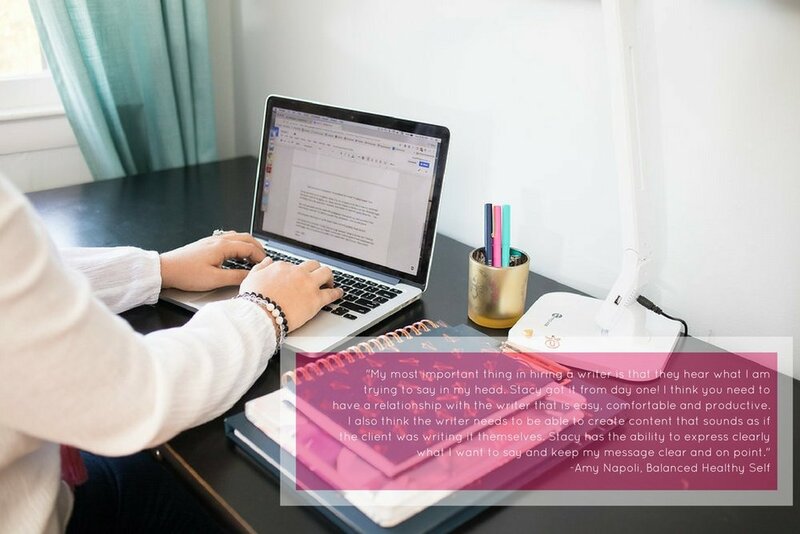 After you book a blog review, I’ll send you a short questionnaire so I can find out more about you, your business and your goals. Then we’ll connect via phone or Skype for 30 minutes to discuss your answers and allow me to dig a little deeper. Once we have a plan in place, I can provide content creation support or you can take action on your own. Things change. Questions come up. Uncertainty steps in. When you aren’t sure what to do next, need help focusing or want to talk through an idea, we can hop back on the phone to chat. Whether weekly, once a month, or just when you’re really feeling the overwhelm, we can set aside time to get together and set you back on the path to action. If I haven’t worked with you before, I recommend starting with a Content Brainstorm session to be sure you feel confident that working together on an ongoing basis is right for you. However, if you prefer to leap right into ongoing consulting, let's do it!